Since 1970, we are proud to serve communities like Georgetown Township. Our dedicated team of installers and technicians provide you the best possible experience, giving you personalized advice for your garage door needs. Call us today at 616-453-0164 to get your free quote or to schedule an appointment with one of our professional technicians. Need help to choose a new garage door? Georgetown Township has been a lumber town, a river landing, a quiet farming settlement, and most recently a growing suburban community. The main architectural styles we can see in the area are Craftsman and Ranch/Rambler. To find the garage door that will fit your house perfectly, take a look through our image gallery. Is your garage door causing problems? Or maybe it is your garage door opener? Give us a call at 616-453-0164 or fill out our service form to get an appointment with a technician. Our company serves the cities of Grand Rapids, Allendale, Coopersville, Holland, Muskegon, Ottawa County, West Michigan, Zeeland and more. 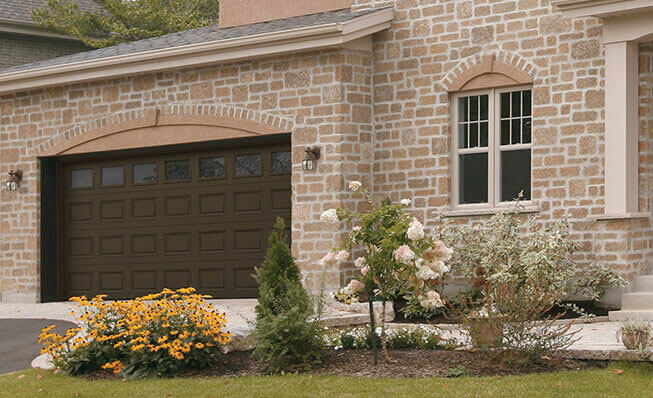 At Environmental Door, our specialties are installing, maintaining and servicing garage doors. No matter if you need to replace springs, rollers, cables, tracks or garage door opener parts, we carry all kinds of replacement parts and numerous decorative accessories. he Standard+ and the Acadia Series from Garaga are the perfect matches to Craftsman and Farmhouse style. Classic, elongated or mixed panels fit perfectly to those home designs. Their R‑16 level of thermal resistance will also improve their energy efficiency. You can design your next garage door in our Design Centre. Because they offer great accessories and reliable performance, we recommend LiftMaster products. The new MyQ experience will make your life even more easier! Contact us to learn about our commercial, industrial and residential garage opener options.